Internet usage gone up drastically? 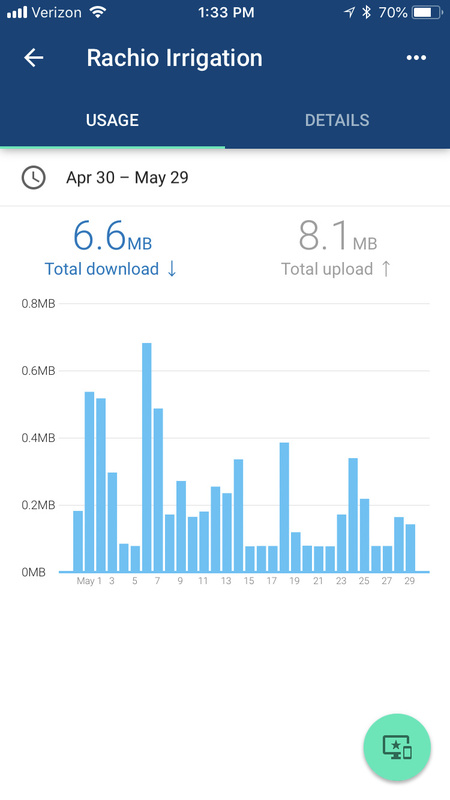 Has anyone noticed a drastic increase in internet usage since installing their Rachio? 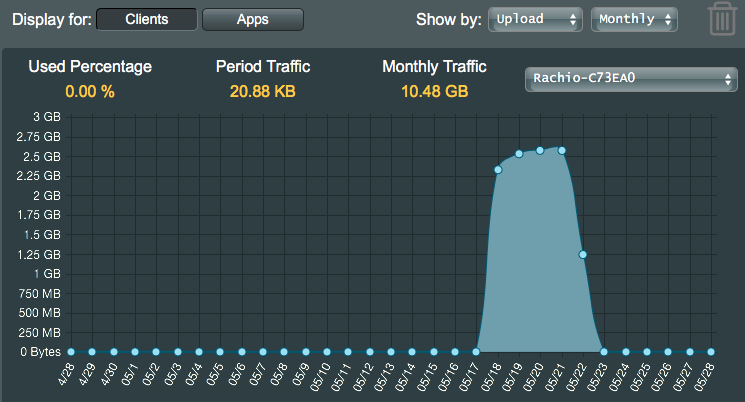 I’m talking in the last two weeks (when I installed Rachio) internet usage is showing 500+ GB already. Nothing else has changed in my home. The only reason that your Rachio would be consuming internet would be if it is stuck in a loop trying to update firmware. Try unplugging your Rachio for a few minutes, then plugging in again. That might clear the problem. Here is the usage history for my Rachio 3. It basically use 6KB average. One time I saw a peak at 3am of 1MB, I’m assuming this was a firmware upgrade. What are you using to monitor this? I’m assuming you can see this same thing for other devices? I’m trying to figure out what is using so much bandwidth. 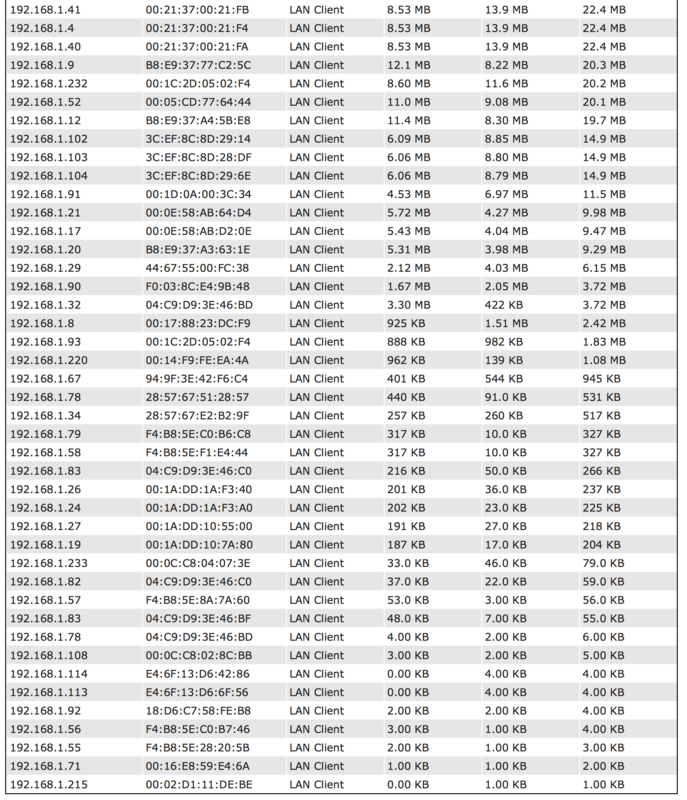 This came from my Ubiquiti network controller. Yes, I can see everything. Mine has used 1.76 GB down and 1.87 GB up since May 12. For some reason yesterday it was running about 5 MB up and 5 MB down for several hours, and then went down to about 56K for the rest of the period shown in the graph. The numbers in the graph are Usage per hour. I installed my Gen 2 between May 10 and May 12, and ever since May 12 it has been solidly connected to my garage access point. 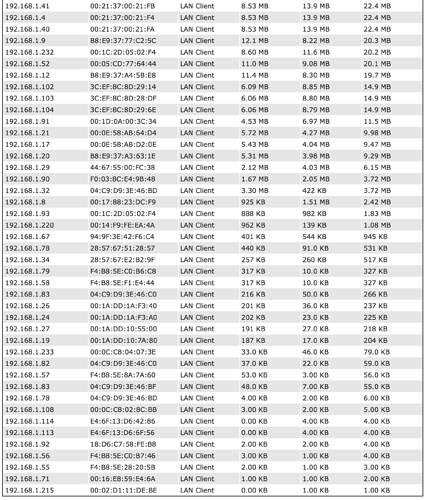 It has used a combined 3.63 GB of use on my wireless network. Over 15 days this is 0.242 GB a day or 0.0101 GB (10.1 MB) an hour. 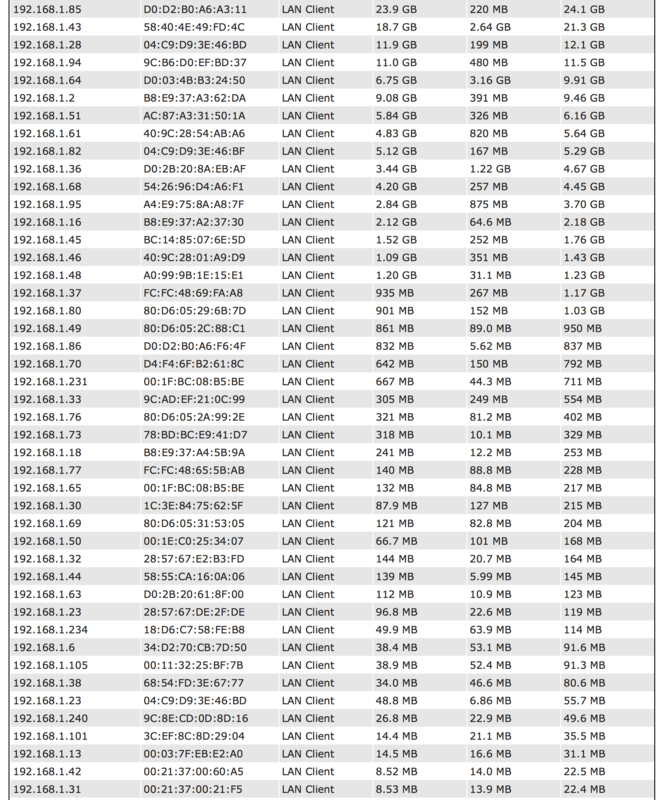 This is the data over my wireless network, not sure if all this data hits the WAN side of my router but this would be worse case. @Eric33432 - 10MB in 1 hr. sounds too much for a device that only hit the cloud (AWS). Is it really transferring all this data? Do you have DPI on this PEPWAVE? I will do some testing later to have a better idea. 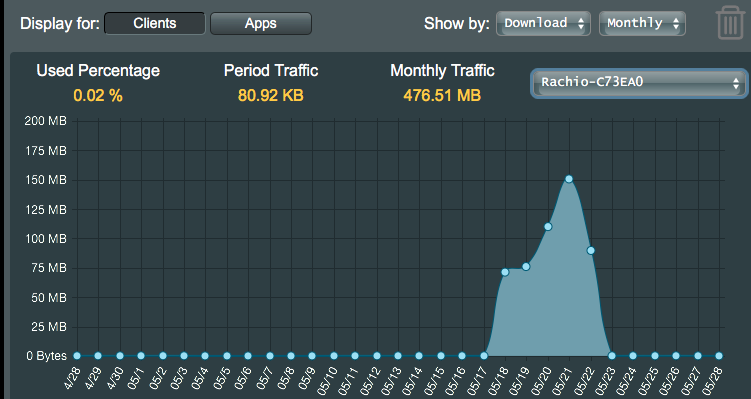 Maybe the Rachio guys can see how much is the traffic between the controller and AWS. 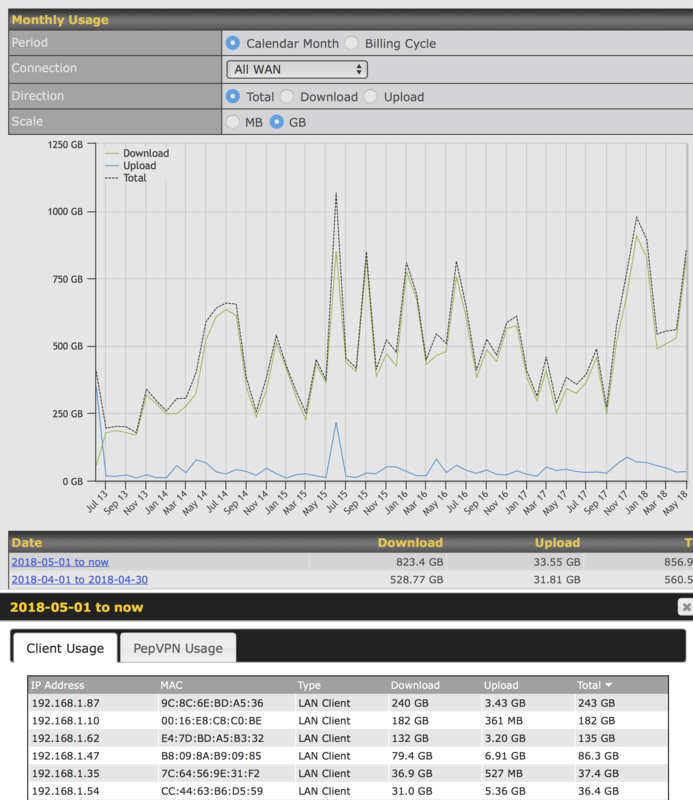 I suspect a lot of the data going over the wifi is overhead that never hits the WAN side of my Peplink router. JEBT2921, with advanced router and WIFI equipment like Ubiquiti or Peplink / Pepwave, you can see a lot. This shows my usage so far for May on my Peplink router. I clicked on total to sort by total usage. Yes, I have a lot of Sonos equipment, iPhones/iPads, computers, TV equipment (every Dish box and smart TV gets an IP address), thermostats, cameras, and other IP stuff around our house. 192.168.1.90 is the Rachio. There are lots of other reports besides this. 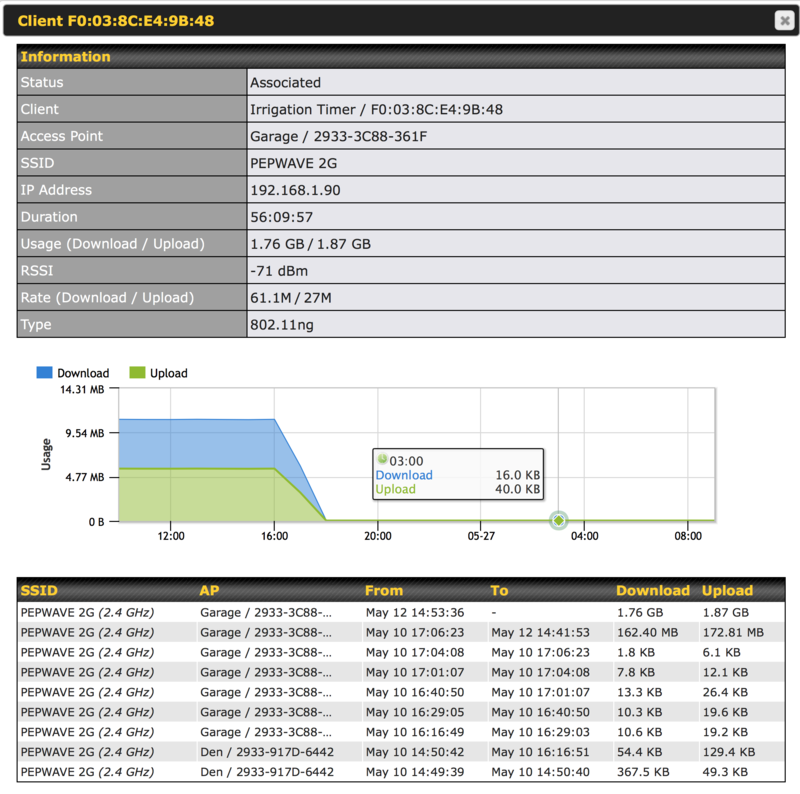 This is from a Peplink Balance 20 dual WAN router. I have it connected to Comcast and AT&T. I am probably an extreme example, but I am a tech geek and an old electrical engineer. I had a temporary, odd spike May 16-23rd – spiked at 2.4GB upload and 143MB download. 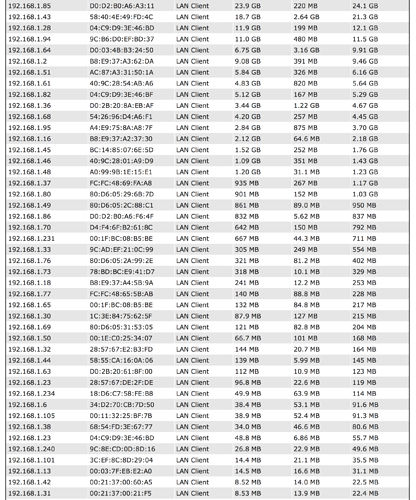 Caveat is I have no idea how much to trust my router’s tracking of up and down data at the client level. That’s pretty cool what device you use to track your data?? I use the latest Merlin firmware on an ASUS router. No idea what stock firmware looks like. For those of us not as wired, the Google Wifi / OnHub gives a pretty little summary as well. I have 60 devices connected to the OnHub + 3 Google WiFi Pucks and it works quite well. Most devices are light switches and bulbs. I really dig your setup!